Second wave. Crashed on outward flight. Harvey Sterling Glinz was born in Winnipeg, the capital city of the province of Manitoba, Canada on 2 March 1922. His father Ernest was a letter carrier, or postman. Glinz was educated at Lord Roberts and Kelvin Schools, and had worked as a clerk in the Hudson’s Bay company until the war intervened. Having volunteered for the RCAF Glinz was interviewed on 11 September 1941, and deemed to be best fitted for work as an air gunner/wireless operator. It was noted that he was “A neat clean – athletic young man – sincere – and should be worthwhile addition to aircrew.” He signed up a few weeks later and was sent off for training. Glinz excelled at his air gunnery training, passing out first in his class in February 1942. 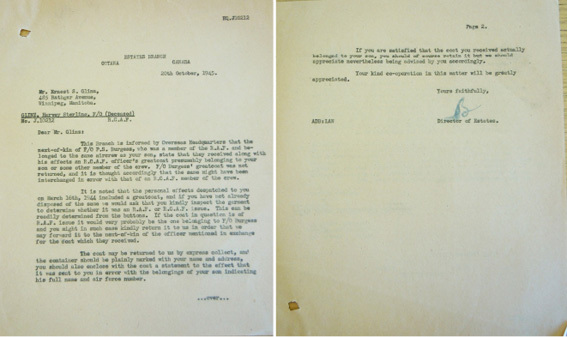 He then applied for a commission, which was granted after he had left Canada. He arrived in England at the end of March. After various delays and yet more training, he was finally posted on operations to 61 Squadron in October 1942. His first operation was a raid on Turin on 28 November 1942, in a crew captained by Flg Off A E Foster. This would appear to have been as a replacement for Foster’s usual gunner. 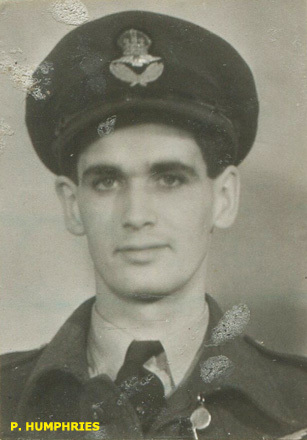 A week later he flew with Flt Sgt McFarlane, on an operation to Mannheim. He finally became part of the regular crew of Plt Off William Dierkes, an American who had joined the RCAF before the USA entered the war, and who would later transfer to the USAAF. He had been thinking things over and wishes to resume operational flying. He has an opportunity of being crewed up with an experienced pilot in whom he has every confidence. This crew is being posted to another unit to form a new squadron. He appreciates that his symptoms are nervous in origin but thinks that he can make the grade and complete his tour… The Board considers this Officer to be a fundamentally good type and should be given a further opportunity to prove himself at operational flying. Glinz was 617 Squadron’s A Flight gunnery leader, a role which would have meant he helped organise training for other gunners. He must have been awarded this role because of his rank, rather than experience, as there were other gunners in A Flight with a full completed tour under their belts. By 16 May, training was completed and Glinz was in the front turret when AJ-E crossed the Rhine near Rees. A few minutes later they approached the line of HT electric wires outside Haldern, and collided with a pylon. The seven bodies were buried by the Germans in Dusseldorf North cemetery, but they could only positively identify Leslie Whillis, Philip Burgess, Alan Gillespie and Charlie Williams. All were reburied after the war, as part of the work undertaken by the RAF’s Missing Research and Enquiries Service. An insight into this detailed and rather gruesome task is given by a page in Glinz’s file. The only clue to the identity of these three were another rank’s shirt in Grave 42 and officer’s shirt in Grave 45 and dental charts in both Graves 42 and 45. As Fg Off Glinz was a Canadian, his dental charts were obtained from Ottawa. They definitely do not tally with the charts in either Grave 42 and 45, and this proves by elimination that Fg Off Glinz is in Grave 46. The fact that there was another rank’s shirt in Grave 42 and an officer’s shirt in Grave 45 makes it possible to allot an individual grave to the remaining two crew members, Sgt Liddell being in Grave 42 and Flt Lt Barlow in Grave 45. Treating the war dead with such respect is an honourable tradition in the military of many countries, and the work that this involved is perhaps not appreciated by us today. In a further sad postscript to the short lives of two of the crew of AJ-E, it emerged in October 1945 that Harvey Glinz and Philip Burgess’s service greatcoats had been inadvertently muddled up when being sent back to their families. The Glinz family were asked to inspect the coat they had received and see whether its buttons were those of the RAF or the RCAF. Having ascertained that they were in fact RAF buttons, the two coats were then exchanged. Whether Glinz and Burgess were roommates at Scampton is not known, but the fact their coats were muddled up suggests they might have been. The two young Flying Officers are now buried together, alongside their five comrades, in Reichswald Forest War Cemetery. Harvey Glinz RCAF personnel file, National Archives of Canada. 61 Squadron Operations Record Book. Many thanks to Allan Wells, Susan Paxton and Ken Joyce for their help. Rank and decorations as of 16 May 1943. The information above has been taken from the books and online sources listed above, and other online material. Apologies for any errors or omissions. Please add any corrections or links to further information in the comments section below. I’ve wondered if Glinz being made flight gunnery leader had something to do with Richard Trevor-Roper sympathetically taking him under his wing. Evidently he’d also relaxed enough to be found in Nottingham socializing with Phil Burgess and Charlie Williams! Editor, there seems to be no place here, that I can find, to make a general comment about your blog/website. So here goes. I have a longstanding interest in WW 2 aviation history. In part because one of my father’s brothers lies in the Reichswald cemetery, like F/O Glintz. I recently stumbled across your website. I read. And then I read some more. You have created a remarkable site that draws the reader in. Into the short lives of these brave men. The genius of your site is the amount of information, the tiny details about so many men. It is not enough to read one or two biographies. That’s how I started. And then I came back, again and again. And when I finally read and scrolled my way to the bottom of the page I had a new and better understanding about these men and about the spirit and soul of Bomber Command. You have a book here, when you get to the end. So – Bravo…Bravo ! Please keep writing until all their stories are told. And if you have a spare moment in August try and see the Canadian Warplane Heritage Lancaster that will be flying with the BBMF Lancaster at various UK airshows. There were quite a few Canadian Dambusters. The CWH Lancaster demonstrates what we think of them all – 70 years later. We WILL remember them ! Please keep up your excellent work. It is much appreciated. The one and only Dambusters blog, bouncing across the choppy waters of the internet since 2008. Compiled and written by Charles Foster, nephew of Dambuster pilot David Maltby, and author of the new book The Complete Dambusters, published by the History Press. All text © copyright Charles Foster/Dambusters Blog. Please do not copy or quote from text without acknowledging source. Pictures © various sources as indicated. Please do not copy pictures without permission from the source. Go to the About this blog page if you want to contact Charles. Enter your email address to follow this blog and receive notifications of new posts by email. We will never share email addresses with anyone else.